Brightwalton and Villages: Halloween masks! Carrying on from the summer the BACYP rural activities programme once again came to Brightwaton during the Autumn Half Term and continues to grow in popularity. 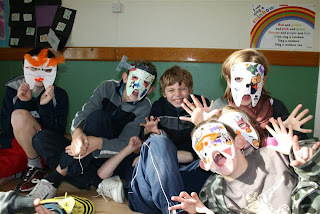 Supported once again by local clubs and coaches the young people engaged in Halloween themed arts, craft and drama creating their own scary masks, (see below), and acting out ghost stories and terrifying tails. More sports where once again on offer as well as the young people where provided some expert rugby skills training, football skills and took part in fun teamwork and problem solving activities. The scheme will once again will be running during the February half term so once again if you have any ideas of the different activities you would like to see available to try please let us know.